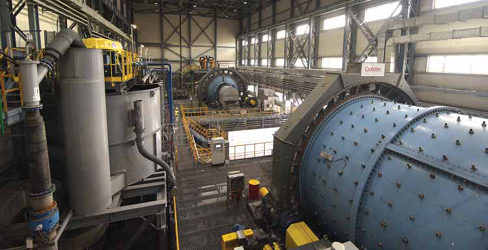 The Kyzyl concentrator (above) is expected to reach nameplate capacity by October. Polymetal International has started up its Kyzyl gold mine in northeast Kazakhstan, ahead of schedule and below budget. Kyzyl produced its first gold concentrate on June 25, following completion of all construction and commissioning activities. Polymetal plans to produce 80,000 ounces (oz) of payable gold at Kyzyl in 2018, ramping up to 280,000 oz in 2019 and 330,000 oz per year (oz/y) thereafter at all-in sustaining costs of $500/oz to $550/oz. Polymetal achieved startup of the Kyzyl concentrator one quarter ahead of the original schedule announced in 2014 and one month earlier than its January updated plan. Project capex is expected to come in approximately 3% below the original $325 million budget, inclusive of 62 million mt of pre-stripping. Mining is ongoing at full design capacity, and 315,000 mt of ore was stockpiled ahead of startup. The grade-control program has demonstrated robust reconciliation with the reserve model, with both ore grade and gold contained tracking slightly above plan. First concentrate deliveries to offtakers were scheduled for the end of July, and shipments to Polymetal’s Amursk pressure oxidation plant in Russia were expected to begin in September. The Kyzyl concentrator is progressing through a three-month ramp-up period, after which it is scheduled to reach nameplate throughput of 150,000 mt/month and recoveries of 86% by October 2018. Kyzyl’s JORC-compliant gold reserves are estimated at 7.3 million oz in ore grading 7.7 grams/mt gold. Current planning calls for open-pit mine life of 10 years, followed by 14 years of underground mining. Additional JORC-compliant gold resources total 3.1 million oz in material grading 6.8 g/mt, indicating strong potential to further extend operations. The Kyzyl project is located in a traditional mining region, with good infrastructure and easy access to grid power and a railway.